When a family runs out of room to grow, they often turn to moving rather than considering a room addition. But selling your home could mean taking an unnecessary and drastic step – when all you needed was just a little more square footage. Burns Home Improvements can help you add on the much-needed space to the house you have loved and created memories in for years. When you bought your house, you chose it because of the neighborhood or the school system or how perfect it was for your family at the time. Over the years as your family has grown, you have created memories and gotten to know your neighbors. Aside from the obvious sentimental value of your home, you should also consider the monetary value. With an unpredictable housing market, you may not be able to sell your home for the amount it is actually worth. Add the cost of moving expenses and the purchase of a new home, maybe a simpler room addition is all that is required to answer your need. A well thought and constructed room addition can add the additional space you need to the home you love. Whenever you add square footage to your home, you’re investing in your property. It will increase the value of your home while providing you the space your family needs to stay. Contact Burns Home Improvements for a room addition quote! 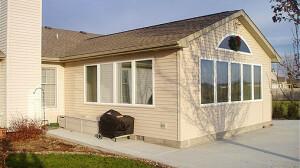 A room addition can accommodate a number of needs that your family might have. At Burns Home Improvements we have worked on a variety of projects and are equipped to handle a room addition from start to finish. We have an architect and designer on our team who can help us locate the best location for a room addition and design it from the ground up. As a remodeling contractor, we will ensure the room addition integrates seamlessly into the look and feel of your existing home. Throughout the entire room addition process, we keep the lines of communication open and consult with you at each phase to ensure that you are happy with the end result. Having a group of strangers in your home and tearing down walls can be a stressful process. We are a family-friendly team that aims to make you as comfortable as possible. Although there will be disruption to your daily life during the room addition project, we implement policies and practices to keep the disruption minimized. Our highly professional and skilled team will work diligently to complete your project without delays. We are an A rated home remodeling contractor with the Better Business Bureau. We provide free estimates on all of our projects. Call us today to begin designing a new room addition for your home. We design and build room additions for greater Boston, including: Medfield, Quincy, Dover, Westwood, Wellesly, Needham, Cohasset, Brookline, Sharon, Norwood and all surrounding areas. Enjoy Strawberry Smoothies this Summer on Your New Deck! Looking To Get A Home Renovation This Summer? We Service in and around the greater Boston area.